Product #1640 | SKU 1486396 | 0.0 (no ratings yet) Thanks for your rating! 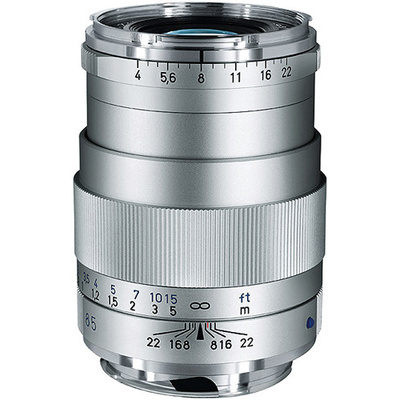 Using a classic Tessar design, the silver Telae-Tessar T* 85mm f/4 ZM from ZEISS is a sleek short telephoto prime for M-mount rangefinder cameras. Using the simple but effective optical design, this lens achieves notable sharpness and clarity, along with virtually no distortion. Its longer-than-normal focal length produces a slight compression for a unique visual quality that is well-suited to portraiture, as well as landscape and other documentary applications. A T* anti-reflective coating has also been applied to resist flare and ghosting for improved contrast and colour fidelity, and its manual focus design permits working with subjects as close as 90 cm away. Using a Tessar optical concept, the simple design is able to achieve a high degree of sharpness and clarity, with virtually no distortion, while maintaining a compact form factor. Manual focus design enables a minimum focusing distance of 90 cm. A 10-blade diaphragm contributes to a smooth bokeh quality.